The Urban Forum is an informal reading/discussion group around “the urban”, from many different perspectives: urban transformation, sociology, geography and ethnography, performativity and concepts of urban space, and urban marginalization, are just some of the topics that may be of interest. This website is the platform where we publicise our meetings, which varies from book presentations to other kind of discussions. We will also publicise call for papers, news on recent books and similar. To follow us, you can choose the RSS format, the email digest (to which you can subscribe on the homepage), or Twitter (here). If you would like to get involved, to suggest a guest for the Forum, or to upload materials to this website, please write to us in the “contact” page. 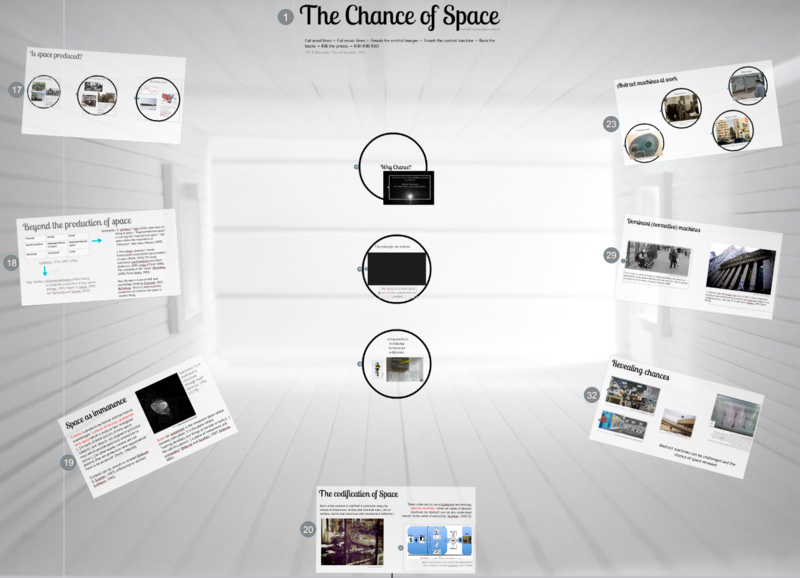 Tomorrow I will be presenting around the notion of “The Chance of Space”, at a workshop in UTS Business School. The presentation fits with my own work around the notion of space. You can watch it below. The presentation aims to confront “space” itself, as pure matter (a quite ambitious task, indeed, which will be hardly achieved). The hypothesis is that because of loose or too strict understanding of the concept, most of the potential offered by space is not grasped and therefore flushed away. Engaging with the philosophical work of Deleuze and Guattari the presentation proposes a conception of space(time) as pure immanence, from which are derived the spatial contexts where social action is performed. Examples taken from movie theory, practices of recycling, photos experimenting, as well as other eclectic things, will help in claryfing the main point of the presentation: namely that space is never produced but only codified, extracted, and domesticated. Following this, the notion of the “chance of space” is introduced in order to highlight that every context always bear unknown potentialities beneath its codified surface. The concluding reflections argue for the importance of questioning the normative codes at play in the spaces that we practice, in order to release at least part of the revolutionary chances that space (and time) can still offer. 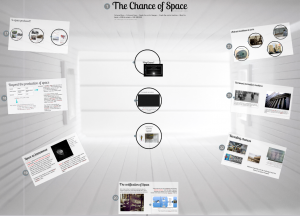 One of the last slides contains a video that I made to further unfold the notion of “The Chance of Space”, using as exemplification some materials taken from the Dr. Chau Chak Wing project. You can watch the video here. 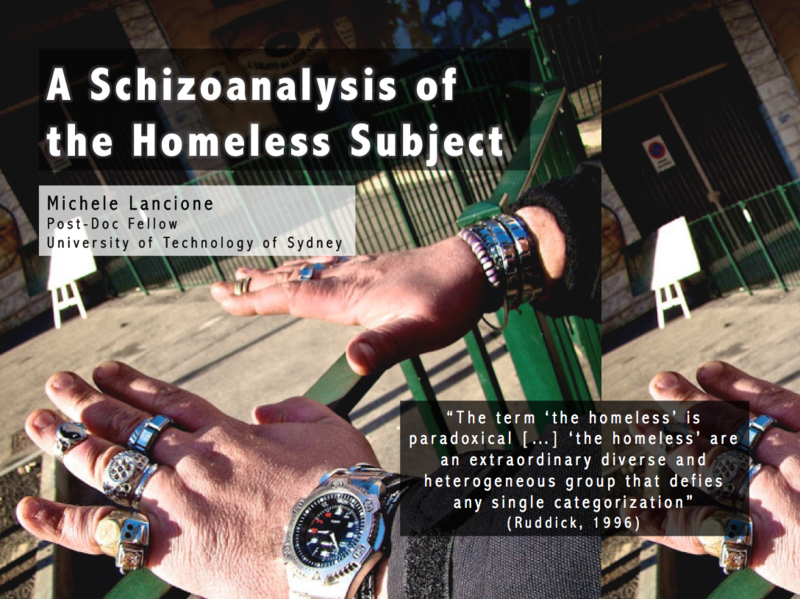 Tomorrow I will present my work on Homelessness at Macquarie University. Here you can download the flyer of the event, and below you can watch the full presentation (done with Prezi). More on my research on homelessness, here. The presentation will begin showing some of the materials collected during a ten months ethnographic fieldwork with homeless people in Turin, Italy. These materials will be presented in forms of interconnected stills, or postcards, picturing the relational entanglements that take place between homeless people and the city. 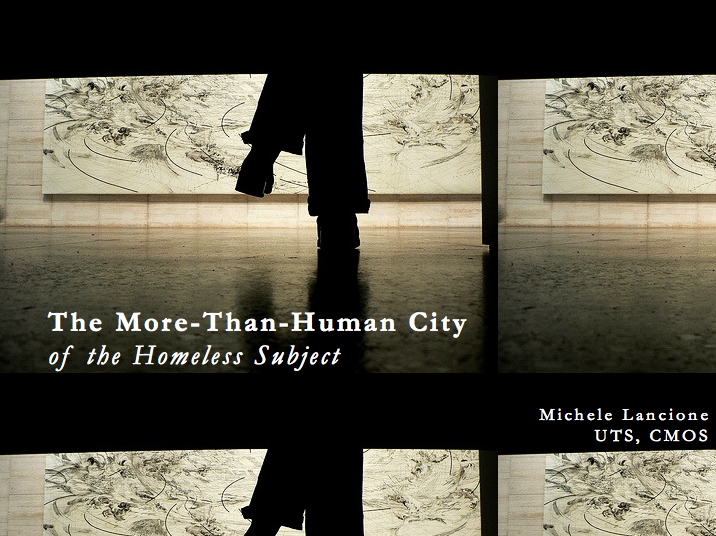 The main aim of the presentation is indeed to blur the canonical distinction between the subject and the city: homeless people are neither only subjects who performs the city (as the “performative” scholarships claim), nor only subjected to the policies of the city (as the “punitive approach” tells), but they constitute their complex and heterogeneous subjectivities with the wider urban environment to which they relate. Engaging with the work of Deleuze and Guattari as well as with critical assemblages thinking, the notion of subjectivity adopted in the research will be sketched and the meaning of the postcards unfolded. In this sense, and through the help of more ethnographic materials, three key-points will be highlighted. 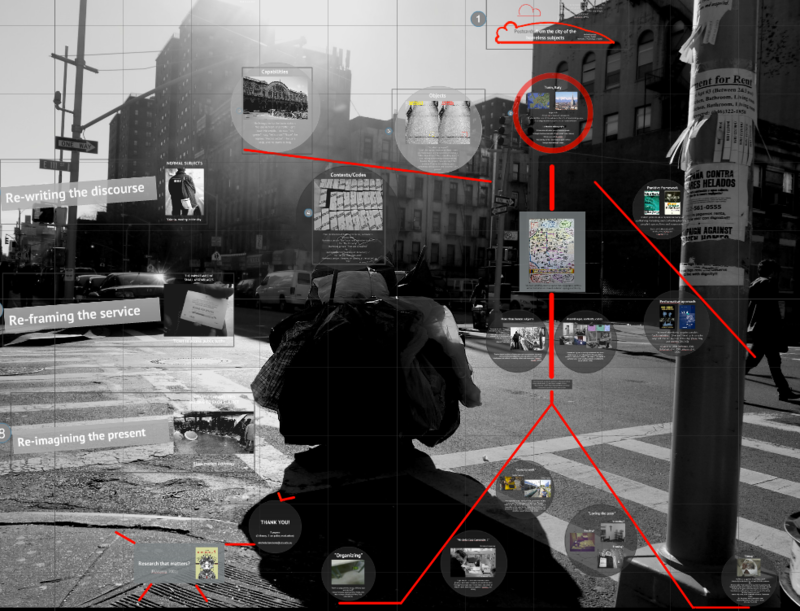 First, the role of urban objects in affecting homeless people projects and desires. Second, the role of normative policies in creating negative affective atmosphere for homeless people. Third, the importance of recognizing homeless people own capabilities. The research implications and the political consequences of the proposed approached will be sketched in the final phase of the presentation. I will present at the “International Conference on Living with Difference” 12-13 September 2012, Marriott Hotel, Leeds, UK. The paper is titled “Different living in difference. 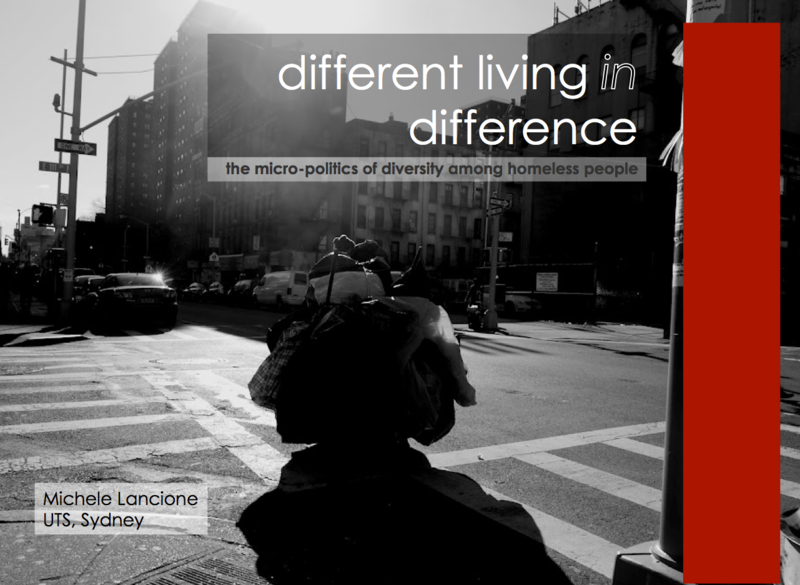 The micro-politics and micro-engineering of diversity among homeless people”, and it is a development of my work on homeless people. You can download the PPT here. This work is based upon an ethnographic enquiry in Turin, North-West of Italy, where the author has investigated homelessness as a subjective condition that emerges from the entanglements between the individual and the city. Taking into account both Italian and migrant homeless subjects, this paper investigates the daily encounter between them, while considering that the two heterogeneous groups are already framed as “different” by mainstream societal discourses. In this sense, the two groups share a stigmatized “common land” (Amin, 2012), where their diversity is constantly re-produced, negotiated and challenged. In order to offer a grounded understanding of these latter processes, the paper takes two paths. The first relates to a description of the practices through which different homeless people perform their common land. Presenting original ethnographic material, the paper shows the relational patterns that emerge in the daily lives of these street people, highlighting how conflicts and alliances depend more on contextual dynamics than personal or group differences. This point is then further explored in the second half of the paper, where the urban, contextual machineries that frame homeless people’s lives are excavated. By showing how mainstream discourses on the poor and the migrants translate into public and private services, the paper argues that it is within these micro-engineered frameworks that a normative kind of difference emerges and becomes an issue. In the end, suggesting a grounded and relational take on difference, this paper concludes by proposing sketches of a politics of care able to tackle the production of normative others, in order to foster the positive negotiation of difference that already exists among homeless people. Amin, A. 2012. Land of Strangers. Cambridge: Polity press. I will present a paper at the 7th Annual Ethnography Symposium, University of Liverpool, 29th-31st August 2012. Below title and abstract. (This is part of my research on the Dr Chau Chak Wing project of UTS Business School, click here for more info). To download the presentation, click here. 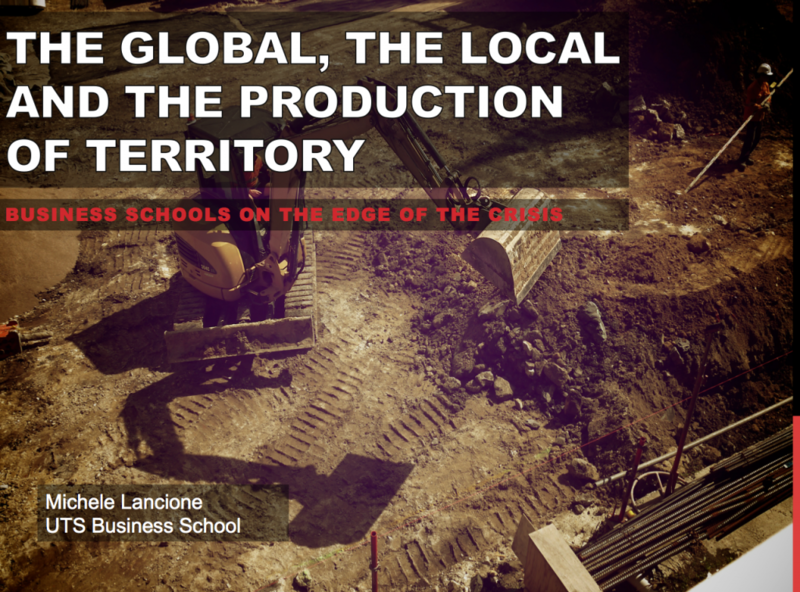 This paper poses a central question: how do “local” territories emerge in the globalized world in time of crisis, and how in particular does this relate to the process of change undertaken by many Business School around the world? In order to answer, the paper re-works canonical understandings of globalization and presents the outcome of a seven month ethnographic fieldwork, which focuses on the process of change currently undertaken by UTS’ Business School. The outcomes of this research are essentially three. Firstly, it provides a fluid and topologically tuned understanding of how territories are produced in the current global economy. Secondly, it unfolds the process of change undertaken by the School, revealing both its rationale and most nuanced dynamics. Thirdly, the paper identifies three movements in the production of territory: aligning, translating and opening. The three forms the “ATOm” schematization proposed at the end of the work, which offers the analytical standpoint from which it is possible to critique the neoliberal rationale underpinning Business Schools’ changes. A new article on the Journal of Political Power. If you would like to read it, please send me an email here. Organization theory, Clegg pointed out, has failed to address the role of organi- zations in some of the crimes of/against humanity, suggesting that more atten- tion should be given to the case of total institutions. 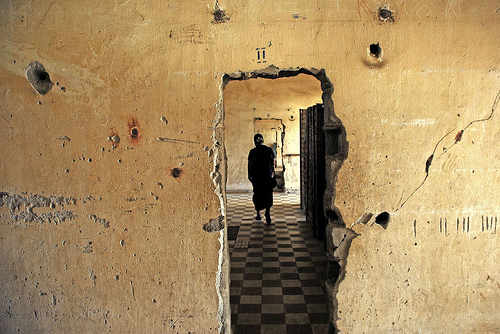 With this paper we respond to Clegg’s invitation and study the S-21 extermination camp, in Phnom Penh, Cambodia. We do so by engaging with the work of the Italian philosopher Gior- gio Agamben, with the aim of investigating the organizational patterns that con- stitute the camp as a ‘State of Exception’. Doing so shows us how organizations can become malign forces for evil. We explore the implications of this case for more general ‘Kafkaesque organization’, that sometimes reproduce, in more benign forms, many of the practices found at S-21. 4 July, 2012 – 7 July, 2012 @ Aalto University & Hanken School of Economics, Helsinki, Finland – EGOS 2012, Design?! This paper investigates the process through which the UTS Business School is re-shaping its identity through a process that includes, but is not limited to, the building of a new facility designed by the Canadian architect Frank Gehry (the Dr Chau Chak Wing building), as well as a major revision of the teaching programs. 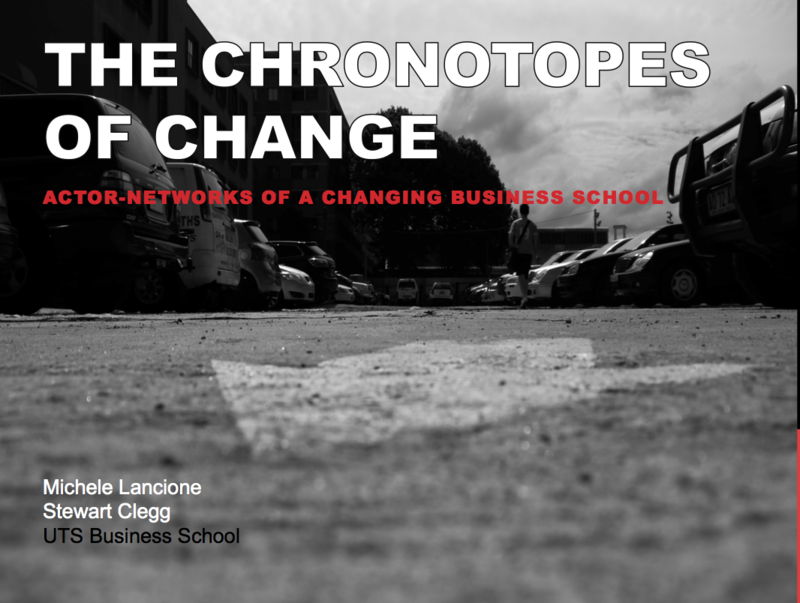 By investigating this project in an Actor-Network Theory fashion, and introducing the notion of chronotope, the paper answers three central questions related to the notion of change: How does organizational change happen in the daily life of a project? What gives unity to a chain of small relational changes? How can processual change possibly be managed? Theoretically, the paper argues that change emerges in the micro-dynamics of organizing, fragments that are sticked together by macro-dominant narratives, in a constant process of translations that occur between human and non-human actants. Moreover, the paper concludes by advancing a particular take on the management of change, which can be pursued only through a constant micro-politics of network maintenance and enactment. More on my research on the Dr Chau Chak Wing project, here. The seminar will offer an introduction to a topological understanding of urban space, from both the theoretical and methodological points of view. The first part will be dedicated to introducing post-structuralist takes on space, briefly presenting relevant extracts from works by Foucault, Deleuze and Guattari. After a brief introduction on how this theoretical framework proves instrumental in the understanding of the contemporary urban, the presentation will then tackle a central question: how is human subjectivity produced in a more-than-human environment? To offer some answers, an account relating to the lives of homeless people in Turin, Italy will be presented. Highlighting the role of objects and codes in the making of homeless people’s subjectivity, the presentation will conclude with a methodological reflection. 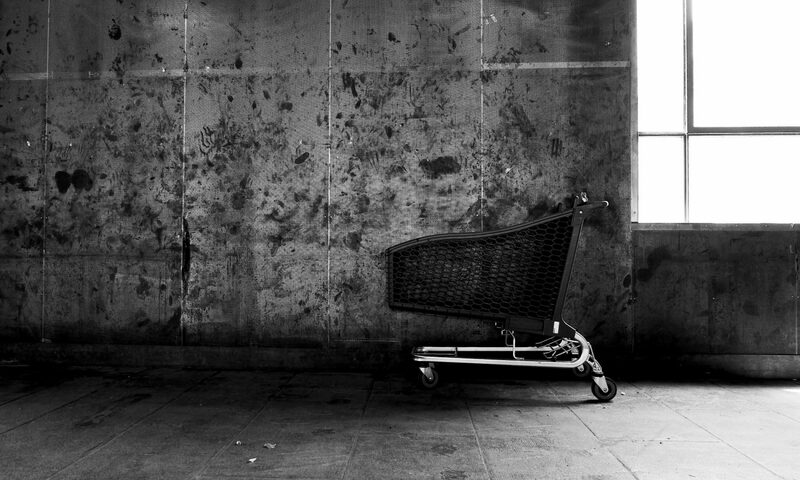 This work is based upon a ten months ethnographic enquiry in Turin, North-West of Italy, to interrogate homelessness as a subjective condition that emerges from the entanglements of the individual and the city. The theoretical framework adopted in the work relies on two main points. Firstly, on a “more- than-topological” understanding of space, able to acknowledge the chances that actually reside beyond the curtain of the codified context where homelessness take place in the city. Concerning this point, the paper relies on Guattari’s notion of abstract machine, as devices that concretely “extract” something codifying it into something different. Secondly, the paper investigate homelessness through Guattari’s notion of the subject, arguing that interrogating homelessness in a more-than-human fashion a world of multiples subjects emerges, with various attitudes, capabilities, relational and affective characterizations. The presentation will be tight and filled up with many exemplifications taken from the fieldwork. Its relevance for this particular session should not be seen in its major engagement with Guattari’s work, but in the tentative to translate few Guattari’s ideas into valuable research tools to investigate the contemporary urban and its issues. More on my work on homelessness, here.